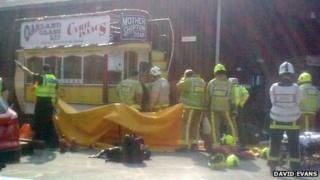 A woman was seriously injured when she was run over by a restored horse-drawn tram on its first outing for 112 years. The accident happened on Monday at the Middleton Railway Festival of Transport in Leeds where the vehicle was being unveiled after its restoration. A groom leading the two horses which were pulling the four-tonne vehicle became trapped under its wheels, suffering serious leg injuries. She was released by firefighters and taken to Leeds General Infirmary. The woman is understood to have undergone surgery on her legs on Monday night, but her condition is not known. The Rail Accident Investigation Branch has started an investigation into the incident. Monday's event had been organised by the Leeds Transport Historical Society, which raised thousands of pounds for the tram's eight-year restoration. Restoration project manager Jamie Guest said: "Our thoughts and prayers are with the lady in hospital." The tram was restored after spending many years being used as a summer house at East End Park in Leeds. The last remaining horse tram in Leeds, it was built in 1898 and is due to go to the National Tramway Museum at Crich in Derbyshire to become part of the national collection.